Brown snakes, one of the most common causes of domestic pet bites in Australia and one of the most dangerous snakes in the world. 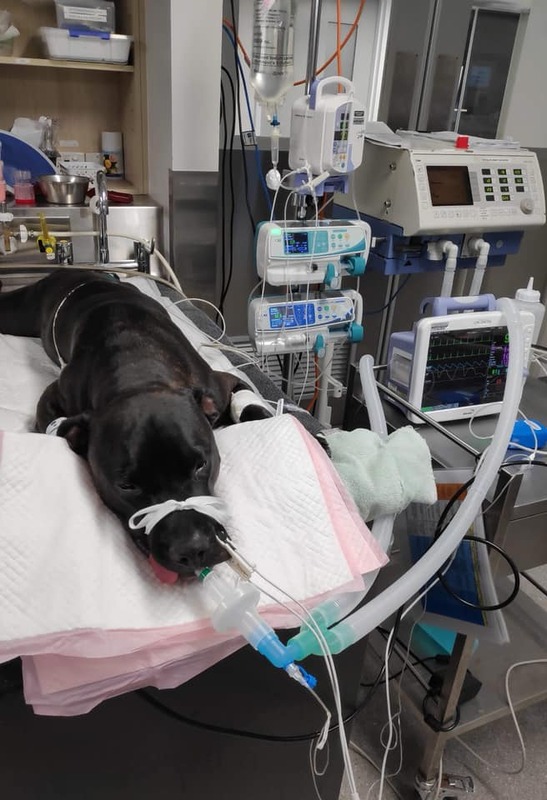 Their bite contains a potentially lethal paralysis causing toxin, as poor one-year-old ‘Boston’ unluckily found out. 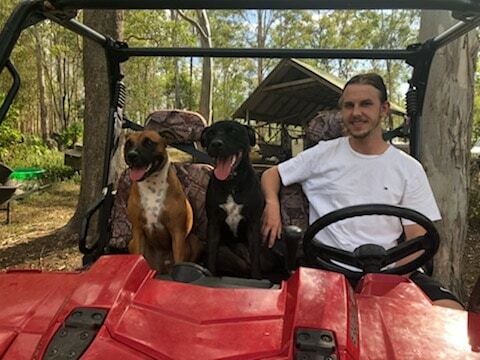 It was a regular day in Bellbowrie while Josh Webber’s two Staffordshire Bull Terriers were chasing his Polaris around the creek. His daily trick to expend the pup’s boundless energy before night time! At one point Boston took a bit longer to emerge from a garden bed, which was not unusual for this excited and curious puppy. Josh’s mum Joanne describes him as becoming “sooky” and trembling slightly as the night went on, but as he wolfed down dinner as usual and went to bed seemingly fine, no one thought further of it. Until, at 4:30am Josh awoke to find Boston motionless, unresponsive and drenched in his own urine. This otherwise healthy and energetic dog went downhill rapidly. Joanne rushed Boston into AES Jindalee. With dangerously low oxygen levels and high carbon dioxide bloods, Boston was now in severe respiratory failure and one very sick pup. Our team had to warn Joanne there was a very real chance he could die at any moment. First diagnosis: Tetraparalysis from tick paralysis vs snake venom vs neuropathy. As Boston was paralysed a full neuro exam was difficult. Corneal ulcers had also developed in both eyes. Dr Deeanna Ho started fluid therapy and performed a Snake Venom Detection Test which confirms the presence of venom and also determines which antivenin is most appropriate. The test concluded: Brown snake positive. After anesthesia, mechanical ventilation was inserted to aid Boston’s breathing. The antivenom was then administered slowly over approximately an hour, with Boston under constant watchful supervision during this time. Due to the complexity and complications of mechanical ventilation, patients are intensively nursed and observed 24 hours a day which gives us the ability to closely monitor oxygen saturation, exhaled carbon dioxide levels, electrical activity of the heart and blood pressure. Boston was severely paralysed but luckily clotting at a reasonable speed. Our team performed a Bilateral Tarsorraphy for the corneal ulcers, where eyelids are partially sewn together to protect the cornea. 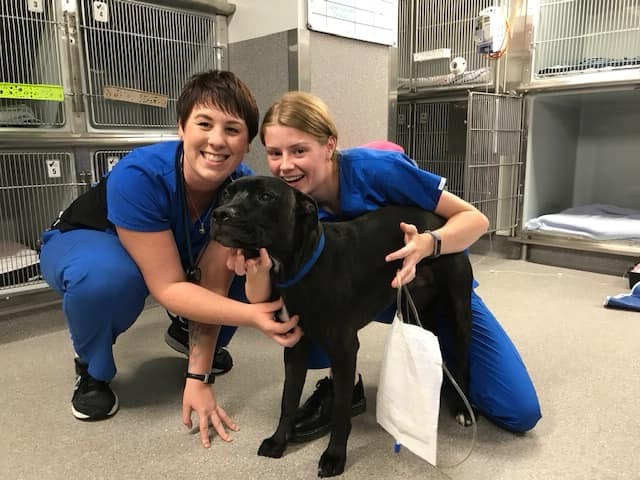 Boston was slow to regain his movement over the next few days but eventually started to resist the eye treatment… Always a good sign of recovery! After 5 long days, Boston was sent home with antibiotics, eye medication and strict instructions to rest for two weeks. Snake venom often causes muscle damage, pain and weakness which can take time to heal. A few weeks on, Joanne reports Boston has “come good again and doing wonderfully”, improving relatively quickly, although still exhausted. He is slowly regaining energy to play but for now, he is happy watching his twin sister chase the Polaris from afar while he gets in some much-needed bed rest. The opportunistic Boston has even taken to napping on Joanne’s bed since… Much to the dismay of the cat! As well as paralysis, Brown Snake venom can cause breathing problems and coagulopathies which are the blood’s ability to form clots. Therefore, any bleeding can turn life-threatening quickly. If your pet is bitten by a snake, please visit your local veterinary clinic or after hours Animal Emergency Service immediately for treatment. Their survival depends on the type of snake, bite location, amount of venom and how fast antivenin can be administered. Having so many hours pass between snake bite and reaching AES, there is no doubt Boston is one lucky puppy. Boston = 1. Brown Snake = 0.